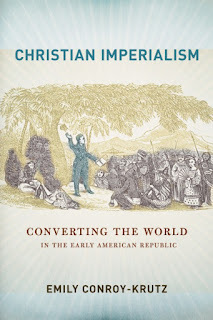 I am delighted to share 5 Questions with Emily Conroy-Krutz, author of the new book Christian Imperialism: Converting the World in the Early American Republic. 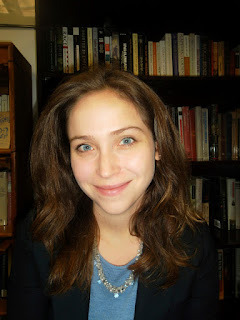 Emily is an assistant professor of history at Michigan State University. She is a historian of nineteenth-century America specializing in the global history of the early American republic. Her book is a part of Cornell Press's wonderful The United States in the World series edited by Mark Phillip Bradley, Amy Greenberg, David Engerman, and Paul Kramer. She is also an associate editor of Scribner’s America in the World, 1776 to the Present, a supplement to the Dictionary of American History. In addition to this interview, Emily was recently featured on John Fea's Author's Corner and Liz Covart's Ben Franklin's World podcast. She has also written a thought-provoking H-Diplo State of the Field essay on "Empire and the Early Republic." I encourage you all to check it out. 1. Christian Imperialism "tells a new story about the way that Americans understood the role of their nation in a global context in the years before the Civil War." Tell us about how Americans understood the role of their nation and how your story can (should?) shift the way we think of the Early American Republic. We’re used to thinking of the early republic as an era that was primarily focused on the North American continent. Yet this is also a period that sees the birth of a significant foreign mission movement that by the 1840s sends American missionaries all over the world. That movement was premised on the idea that American Christians had the right, and the duty, to go just about anywhere in the world to spread the gospel of American Protestantism and Anglo-American civilization. We have here a group of Americans who understood their country to be a Christian nation, and believed that status to require a particular engagement with the world. They wanted America to emulate aspects of the imperialism of Great Britain, but with a deeper commitment to evangelization. The story of foreign missions, then, should help us to think about some of the ways that the questions of what the US should be, and particularly how it ought to relate to the rest of the world, was not yet set in the early republic. This was a period of contest over the meaning of empire and the role of religion in defining American identity, and foreign missions are a great window into that. 2. Your book employs two terms, "Christian imperialism" and "hierarchy of heathenism." Can you explain these terms to RiAH readers? “Christian imperialism” is my term for the vision that missionary supporters had of how Christian nations ought to engage with the rest of the world. According to this, Christian nations (as US missionaries considered both the US and England to be) had a duty to fulfill the Great Commission to spread the Gospel throughout the whole world through their foreign relations. For Americans in the beginning of the nineteenth century, the British Empire and US commercial expansion seemed to suggest that they now had the ability to physically get to what they call the “heathen world,” and accordingly, they had the duty to do it. They saw empire as, at its best, a tool in this work of global evangelization. My book looks at what happens when that imagined conception of empire meets the reality of actual geo-political empires. The “hierarchy of heathenism” describes the process by which missionaries figured out how to do that work. Their ultimate goal was to convert the entire world to Protestantism. But the world is a big place, and missionaries understood that they needed to be selective about where to prioritize. Over the course of the first several decades of their work, you see a process of selection repeated again and again as they gathered information about different parts of the world and tried to decide where to focus their resources. The most important thing in making that decision had to do with how “civilized” they believed a place was, and therefore how likely its people were to convert. That tended to be based on proximity to Anglo-American imperial projects. Missionaries effectively were trying to measure how likely a place was to convert to Anglo-American Protestant culture. As they debated whether to work in Asia or North America, or whether to go to Africa at all, you can see this hierarchy and the ways that it structured their thinking about the rest of the world and America’s place in it. 3. From the description of the book, and our conversations about it, it seems like you see evangelization and commercial trade as closely related (explaining how the ABCFM, for example, "exported" Protestantism. How do you see religion relating to the commercial interests typically associated with imperialism? Yes, there are some really important connections. It’s no coincidence that when we map American missions and Anglo-American commercial and imperial projects, we see significant overlap. Trade creates the physical possibility of the American entry into foreign missions: you can’t go out and convert the world if there isn’t a boat that will take you there. So on that material level, commerce matters. But it also matters in the ways that Americans imagined the rest of the world. The entry of objects from foreign places into US markets was important for American understandings of foreign peoples, their “civilization,” and so on. Texts, too, circulated through these trade networks and sparked the missionary imagination. Trade and empire tended to be the deciding factors for which places Americans learned about, and which they didn’t. As important as the existence of commercial networks was for the existence of missions, this does not mean that missionaries were enthusiastic supporters of commercial imperialism. In fact, they could be quite critical, particularly when they thought that a government was more interested in commercial gain than saving souls and spreading civilization. Such critiques arose when nations did not live up to the missionaries’ Christian imperialism ideal (for example in Liberia, India, and the Cherokee Nation). 4. As a work of religion in American history, your book looks well beyond the United States and its citizens. You include American encounters in India, the Cherokee Nation, Hawaii, Liberia, and Singapore. Is this a reflection of the way you understand American history more generally (or the way you teach it)? This is definitely a global story, and I had a lot of fun tracing the missionaries as they went all over the world. The wide geographic scope and the unlikeliness of their project at such an early date drew me in and got me asking questions about the early republic that I hadn’t been thinking about before. Who were these Americans in India, Liberia, and Singapore? What did they think they were going to accomplish in the 1810s, ‘20s, and ‘30s? The project has absolutely shaped my thinking about American history more generally and helped me to think about the ways that US domestic events were in conversation with global events. It has found its way into my teaching, particularly when I teach colonial or Revolutionary America, and US and the World. 5. Now that you've told this story, what story are you looking to tell next? The next book project is going to look at women in transatlantic religious and benevolent reform. I’ve been fascinated by the discussions I saw for this project about missionary marriage and the role of women in American and British missions, and I’m starting to look at the ways that those conversations were part of a larger discussion about women’s position in benevolent and reform movements before 1840 in the US and Great Britain. It has been a lot of fun so far to be getting back to the archives and women’s history.